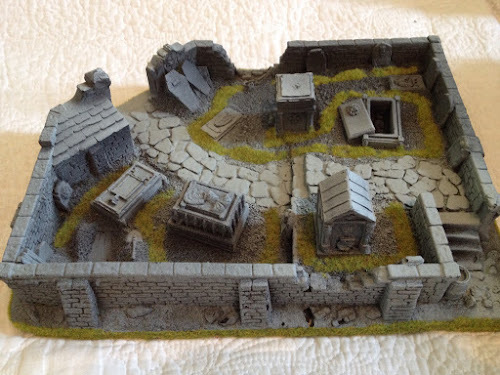 I have a couple of the old Games Workshop foam scenery pieces, but can't decide whether I should repaint them. Here's the Cemetary. What's great about these models is that they are nicely detailed but remain fairly robust. I've made up quite a few items of scatter terrain as part of my drive to catch up on the basics and create scenery for various scenarios. Storing terrain can be a problem - especially if you use tufts. Items can't simply be stored on top of each other, otherwise the tufts and other more fragile bits get squished. Transporting terrain can be a nightmare. All that careful work can be so easily ruined... So, the GW scenery is useful because it's easy to store and easy to transport. Yet... It's just crying out for a makeover to really make it pop! But I don't want to ruin the terrain. So what do others think? Repaint or leave alone? If you've repainted any of these foam pieces, do you have any tips, especially with regards to removing (or painting over) the bright green grass and priming in a way that doesn't melt the foam? Oh, and in case you're wondering... 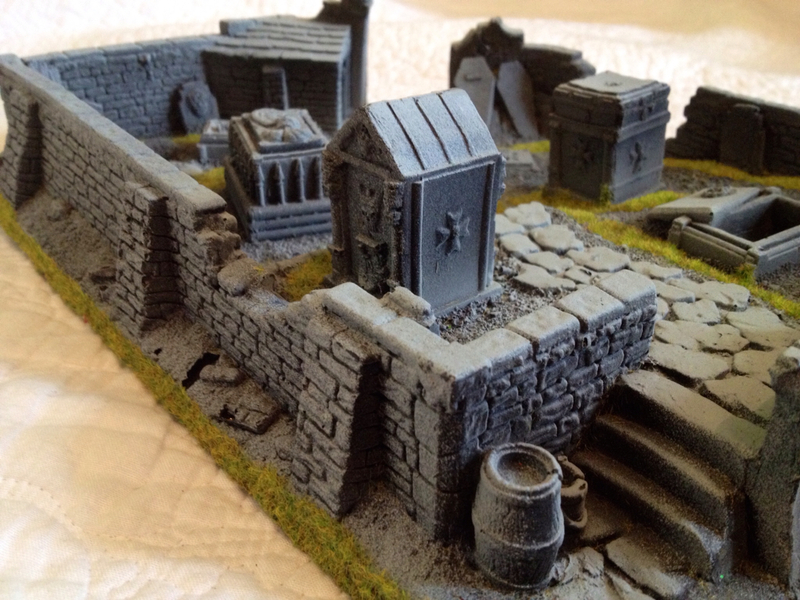 The Cemetary will find its way into a secluded wooded area, near an old dilapidated rectory... Hold on! Wasn't that statue looking the other way?! What about some washes and some drybrushing? Takes a few moments and will improve the terrain (which by the way looks good). That might be an option, although I not sure how well the wash will take to the foam. Might need to try on a small area. I think it looks pretty good as it is. If you're really keen then I'd concentrate on details rather than repainting the entire thing. Patch up damage (if there is any) and perhaps redo the barrel at the bottom of the second picture and the coffin lids at the top of the first one (the same grey as the stonework doesn't look quite right). I'd certainly like to at least tackle the details. But that bright static grass! I agree looks good as it is. I suspect I'll leave it alone for a while, but may well come back to this once I have a bit more experience with hard foam.